Today starts a big, four day, Muslim festival. Everyone is running around in traditional robes, and the streets are noticeably busier. With more locals around, it is possible to make an observation about how women are treated with less respect. I can walk in a straight line and easily get where I'm going. Looking around my travel companions, Kelly, on the other hand, bumps shoulders with the men as they go by. They seem to harass her more when trying to sell their wares. If we are together and she asks for directions, the answer sometimes comes my way. It is different than what we're used to. We went to see what remains of the slave trade. The Anglican Cathedral is now built over the site, but they maintained a few of the "horror chambers" where the slaves were kept. It was a little depressing to learn about, with intentionally small rooms being stuffed with humans. The cathedral itself was nice, but it was clear that stones get tossed at the windows every now and then. The culture clash here is alive and kicking. We had Ethiopian food for lunch. This was a first for many in our group. It should be quite authentic, based on the proximity to that country. As with all the meals we have been getting here, delicious. The afternoon was whiled away going through shops and drinking at local establishments. Many were closed for the holidays. There are many more things to see in Stone Town, but the concensus is that it is not interesting outside of the tourist areas. Or perhaps not inviting. The heat doesn't help, it is very hot and humid. It would seem a number of our group is eager to get out of here. I can sympathize, though knowing we are flying out tomorrow tends to leave me with the feeling there is never enough time to explore things fully. 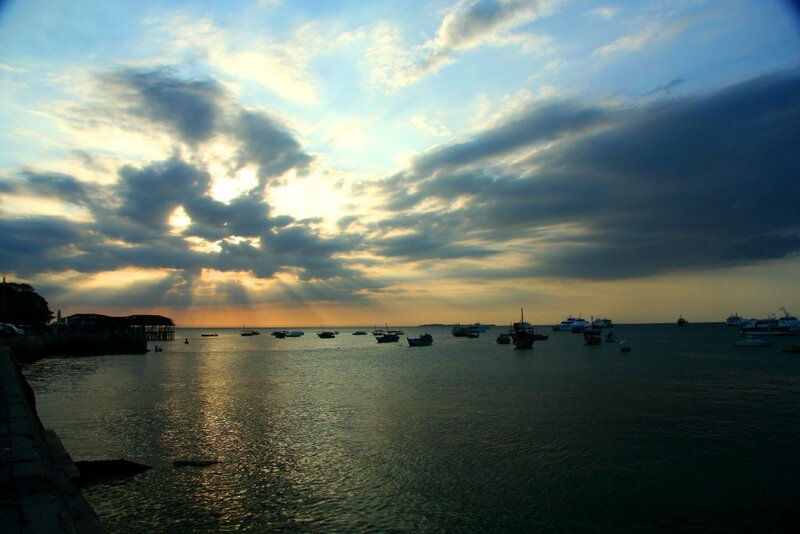 Sunset off the coast of Stone Town can be quite dramatic.